Just over one million New Zealanders say helping the country reduce its greenhouse gas emissions will depend on how much it costs or benefits them. Just over a million say they’ll help regardless of the costs or benefits. Around 260,000 say they won’t help. The willingness to help is linked to whether people think climate change is a problem or not, according to a Horizon Research nationwide poll. 8% (around 256,000) are not prepared to help at all. Those most worried about personal benefits to them are business decision makers, professionals, senior government officials, technical mechanical and skiled workers and the retired. Removing those who are not sure, 54% of business managers and executives say their actions depend on costs and benefits, 29% say they must help regardless of cost. 44% of teachers, nurses, police and other trained service workers say it depends, while 30% say they will help regardless of cost. 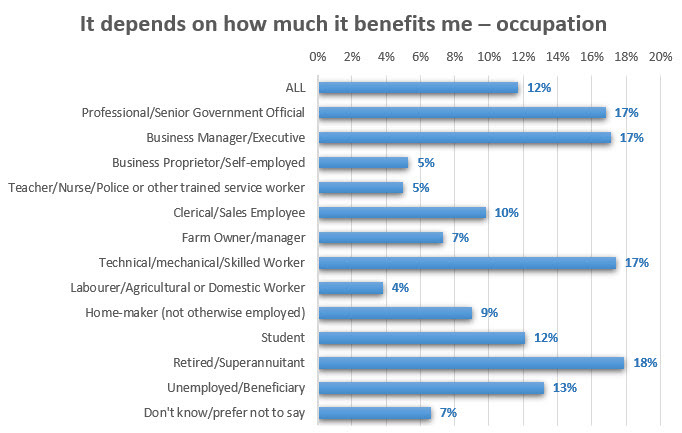 34% of homemakers and those not otherwise employed say it depends, 31% say they’ll help regardless. Nearly 50% of retired people say it depends on cost and benefits t them, 31% say they’ll help regardless. The results indicate that while 64% of adults nationwide believe climate change is a problem, 29% of them saying it is urgent (and 30% say it is a problem for later or not a problem) the real challenge for the Government or Parliamentarians will be managing the country’s response – to deliver benefits and reduce the impacts of costs and trade-offs New Zealanders will need to make as emissions are cut. Horizon surveyed 1,164 respondents aged 18+ nationwide between March 20 and 27, 2018. Quota sampling and weighting were used to achieve a representative sample the adult population at the last census. At a 95% confidence level, the maximum overall margin of error is +/- 2.9%. An earlier result found New Zealanders’ concerns over climate change at their highest level in 10 years and a majority want all parties in Parliament to agree on plans to act on climate change.